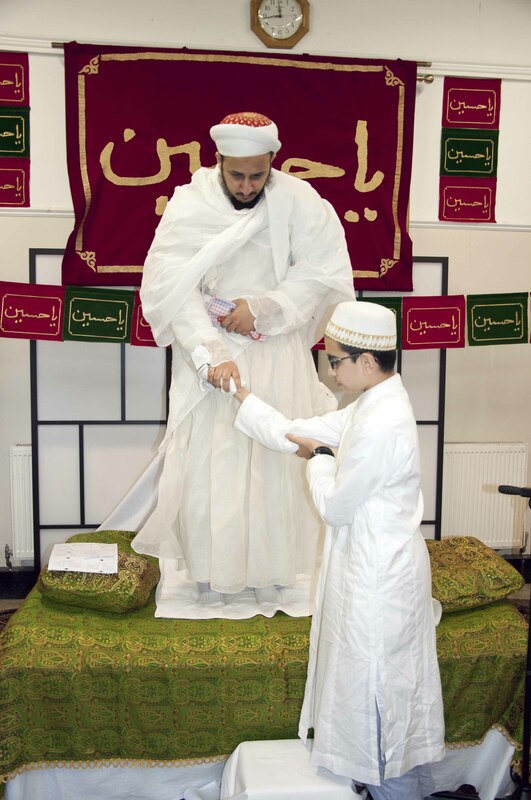 In London UK, the first waaz of Ashara Mubaraka 1439 was presided over by Shezada Dr. Husain Bhaisaheb Burhanuddin at the London Ashara Waaz Hall, by the raza mubarak of Syedna Taher Fakhruddin from the eve of 2nd Muharram. The first waaz opened with the remembrance of Panjantan Pak, and called out to Mumineen as the sincere followers of Panjantan, who have knowledge and understand who the Panjetan Paak are. Shehzada Husain Bhaisaheb expounded that 1400 years after Rasulullah, and 900 years after Tayyib Imam went into seclusion, we still have knowledge of the Imam of the age, of all the Imams and of the Panjetan Paak. This is because he who is appointed by the Nass of Imam, the Dai-l-Satr, is present among us, our guide, our Maula, the receiver of the knowledge of the Imams through Nass. It is he who through the authority of Nass leads us and calls us towards the Imam of the age and his Dawat, he who calls us to know the Panjetan Paak. A binding force through each waaz was the rationale, delivered by Shehzada Husain Bhaisaheb which resonated with crystal clear precision, that in each age, the mansoos alayhi, - the designated appointed successor, - is the one authorized to lead us; and to expound knowledge of the Imams to us; and to interpret this knowledge to us in every age. In the very first waaz and in each waaz thereafter the need for intellect in religion, to understand faith by reason and meaning was stressed. He explained that the meaning of the Quran ayat, ‘we have created man in the best stature’, cannot be a physical attribute but rather is the virtue of intelligence with which he is endowed making him superior to all other animals. It is up to each individual to use his intelligence and seek this spiritual knowledge and adorn our souls with it. Mankind prides itself on being understanding and of understanding and taking wise decisions, rather than blind decisions, in all matters of his/her life. In religion it is all the more important. It is a false dichotomy to diametrically oppose religion with science, when indeed creation and life and its understanding involve science and both are rational, both are in fact intertwined. This theme of intellect, of reasoning, of understanding, as opposed to blind faith, was the backdrop to each of his excellent waaz. An overall theme running through Shehzada Husain Bhaisaheb’s waaz was the hadith of Rasulullah, that being a Mumin constitutes and more than just giving misaq - it demands 6 traits that a Mumin must display to be justifiably called a true Mumin. 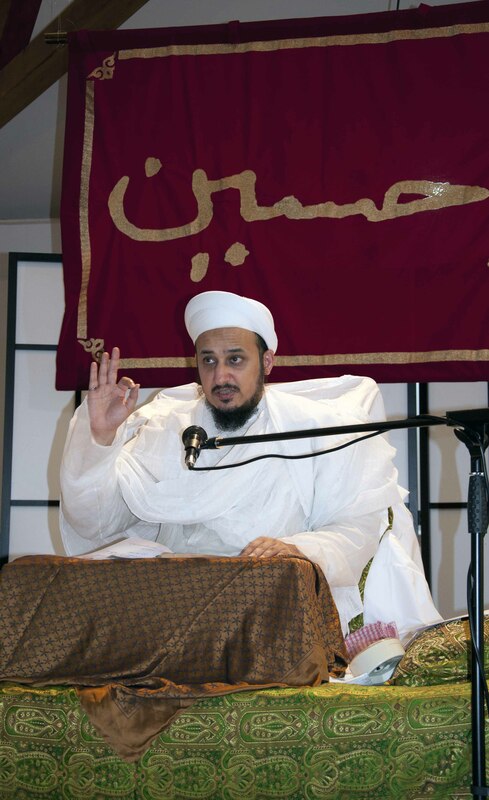 He explained that we will listen to 3 waaz of Mawlana al-Mannan Syedna Taher Fakhruddin, and that in the remaining 6 waaz he will explain each of these 6 traits based on examples through philosophy and grounding them in history and what this teaches us and that in Ashura afternoon he will read the maqtal of Imam Husain. Shezada Husain Bhaisaheb corroborated its meaning and application through examples of the history of the Dawat, and its philosophy so that Mumineen could make these 6 traits a life template and treasure of guidance. The first trait is that to be a true Mumin, one must comprehend knowledge, aaqilan bi al-al-ilm, - of both the world and the spiritual world of religion. The Fatimi Imams sponsored scientists to explore the facts of the universe as well as being holders of divine knowledge of the meaning and genesis of creation and its philosophical purpose. Shezada Husain Bhaisaheb explained that our Imams and Dai’s have always balanced life’s pursuits encouraged progress and upliftment. Pursuing knowledge through school, college, university and fulfilling our wishes in this world, is worthy and commendable. He also explained that our spiritual knowledge however is superior. Why? Because, when we leave the world, we will leave our worldly accomplishments and worldly knowledge and jobs behind, but that gain of spiritual knowledge and application of the teachings of Allah through his appointed one, will secure eternal gain. The Quran is addressed repeatedly to ‘people of knowledge’, ‘people of insight’ ‘people who comprehend’. It is up to each one to seek knowledge and understand the structure of our faith, and to ask questions if they arise for example why are their 5 prayers in the day, why does each namaz have differing numbers of raka’ats. Allah Ta’alas religion on earth comprises these deep meanings and they were endowed to our Prophet, Rasulullah and then through successive Nass to each Imam and Dai. Shezada Husain Bhaisaheb then related the parallels of how Sayyid al-Shuhada Husain established proof in Karbala amongst the enemies, that he is the rightful Imam. Simalarly the the Dai of Husain, 53rd Dai al-Mutlaq Syedna Khuzaima Qutbuddin, established proofs of his Nass and his rightfulness and rebutted the falsities of false claimants and how he bore their transgressions and aggression against him. Husain was refused and the enemies inflicted the utmost transgression upon him. The Dai of Husain was refused and his opponents hurled aggression, violence and slander against him. Syedna Qutbuddin called them to an open debate, but they skullied away and ran. Today Syedna Qutbuddin has passed to the heavenly abode in the sanctuary of Husain. Shehzada Husain Bhaisaheb stated the mostly lofty maqam of Maulana Ali and of his unsurpassed knowledge: who else could say, “Ask me that which you wish under the throne of God!” The basis of the Dawat is ‘ilm, - knowledge. Rasulullah imparted the knowledge that Jibareel brought down as wahy, - revelation, upon his heart to Maulana Ali, his successor. It is up to Rasulullah to appoint his successor, as much each successor appoint his successor. With resounding clarity Shehzada Husain Bhaisahb explained why this link is essential and without which there is no recourse to access the correct knowledge. Just as each Imam appoints his successor, each Dai knows through the inspiration of the Imam knows who is the most worthy of Nass. It is stated in our books, “He will not appoint except he who is exactly like him.” Shehzada Husain Bhaisaheb continued to explain the rationality of religion, explaining that while worldly science changes, and theories are reversed or superseded, - for example Newton’s theory was later superseded by Einstein’s theory of relativity, - the haqiqat of truths about creation and its process are eternal, and comprise the absolute truths and ultimate realities. Science, advancement, knowledge and progress is worthy, and if a Mumin is taught he should learn with humility, not think that he knows everything. In the world, experts speak in their field and in religion too, where the highest philosophical concepts are considered, this is also the case. Within this context, Shehzada Husain Bhaisaheb related the second trait that is essential to be truly called a Mumin - with knowledge, ‘ilm, it is essential to do ‘amal, acts that fulfill and follow that knowledge. Our Hudaat have always encouraged Mumineen to uplift themselves in both worlds, that of the here and now, and that of the hereafter. He explained that both the life of this world should be nurtured as should God fearing-ness and acts of piety and worship for the next. If however a Mumin faces a predicament and is challenged to choose between the path of worldliness or of religion, then he should choose religion. Shehzada Husain Bhaisaheb related the history of our Hudaat through history, and the sacrifices they have made to uphold the Dawat. He related the example of ‘Isa Nabi and his martyrdom, and of Maulaya Raj, who cared so much for each and every Mumin that during the fitnat of Ja’far he went to each Mumin’s house wearing the clothes of a poor man and when answered took the opportunity to earnestly council them towards the path of truth. Finally when the opponents discovered he was doing this, they seized him and cut him to pieces. Many a time we have heard Burhanuddin Aqa recount the account of Maulaya Raj and how it is because of him we are a Mumin today. Mumineen’s baseerat and understanding was sharpened as the waaz culminated in remembrance of greatest of sacrifices. Shehzada Husain Bhaisaheb detailed the shahadat of Maulana Ali Akbar, and how he shunned the life of the world and sacrificed his life, saying no to tyranny and upholding the banner of Islam, and the word of Rasullulah and his teachings. The reward, as Ali Akbar showed us within the tragedy of Karbala, is the greatest of rewards, when in the final breaths of a Mumin, he sees that the Panjatan Pak come to receive him and guide his to the abode of heaven. Husain Bhaisaheb prayed the shahadat of Imam Husain and his Ashab and Ahle bayt, who sacrificed everything for the sake of religion. Shehzada Husain Bhaisaheb started the waaz by recounting the shaadi of Maulana Ali and Maulatuna Fatema. He related that on this occasion, the happiness of Rasullulah was unsurmountable. On this occasion like leaves, slips of papers with the name of each Mumin man and woman became attached on the tree of ‘Tuba´ in heaven. A farishta will read each slip and call each person, who is a follower Mumin of Ali and Fatema. Shehzada Husain Bhaisaheb emphasized again the need for knowledge and how the Quran uses the metaphor of ‘water’ as symbolizing ‘ilm, knowledge, and how through this all things are given life. True knowledge acquired through the ahle bayt and their Dai’s, purifies the soul and protects it from the whispers of the devil. He expounded the third trait of Rasullulah’s hadith about the need to do sabr, to have fortitude, forbearance, patience, and have shukur, - be grateful of the bounties of Allah upon us. Numerous ayats of the Quran, such as ‘seek aid through prayer and sabr’, ‘verily those who do sabr will be given reward without bounds’ together with hadith of Rasullulah and kalam of our Imams were explained. Sabr for faith is in the place of the head in a body; without it is not functional. He urged Mumineen to do sabr in these difficult times, to counsel each other with support and aid his fellow brothers and sisters in faith, when the opponents of the true Dai, Syedna Taher Fakhruddin, have taken control of the masjids and community assets, and many live under fear of persecution should they profess their faith. He stressed again the authority of Nass and made several unshakeable arguments based on the Quran and rational about what the authority of Nass is and how it prevails. Listeners listened to the inspiring bayaan, fortifying their strength and yaqeen and understood the sacrifice of Imam Husain with greater and greater depth as Shehzada Husain Bhaisaheb recited the shahadat of Imam Husain, recalling when Imam Husain prayed on that day, submerded in trajedy, ‘we praise Him, in times of both happiness and of infliction’. With the previous day being a day in which we received azeem ne’mat of Maulana TUS relay (from 3rd Muharram), the waaz ended with the shahadat of our Nabi, Rasullulah, and of his Shezadi Maulatuna Fatema. Tears of grief flowed unstoppably as Mumineen were reminded of sacrfices borne by Rasullulah to establish the religion of Islam, fi sabil Allah, and the tyranny inflicted upon Maulatuna Fatema and ahle bayt Rasullulah, after wafaat of Rasullulah. In his fourth waaz Shehzada Husain Bhaisaheb expounded on the fourth trait described by Rasulullah's hadith of how to live with compassion, kindness and affinity amongst our fellows, both Mumineen and others, and be trustworthy and honest. A Mumin’s acts should speak of the teachings of our Hudaat. He said God rewards us for each act however small and the reward is based on our inner intention, and that log dekhai reaps no reward. In this waaz he enumerated the countless virtues of Maulana Ali, Amir al-Mumineen and explained the meaning of the ayat, ‘those who give zakat when they are in prayer bowing to Allah’, and how Maulana Ali gave his ring whilst praying as sadaqa. Shehzada Husain Bhaisaheb also related some very interesting accounts recorded in our kitabs about the benefits of certain foods. Among them were apples bringing health to an ill heart, and alleviating cowardice; pomegranate aiding the digestive tract; dates fighting the effects of poison and giving strength; daal softening the heart; rice deflecting 70 illnesses' honey which has curative properties.. He also related the harmful things. Shehzada Husain Bhaisaheb read the shahadat of Imam Husain followed by shahadat of Maulana Ali, Mushkil Kusha, and the inflictions he bore from the tyrants. The Ashara london Hall resounded in the matam of "ya Ali ya Ali ya Ali." In the fifth waaz, Shehzada Husain Bhaisaheb related the virtues of Hasan Imam. He recounted how Hasan Imam answered the villager who asked what he should do for a mistake he made during Hajj. Umar was unable to answer and when Hasan Imam did, Umar tried to deride him, only to be embarrassed further by Hasan Imam’s response based on true knowledge. Maulana Ali kissed the forhead of Hasan Imam and recited the ayat 'zuriyyatan ba’duha min ba’d, wa Allah sami’un alim’, showing that Hasan Imam is the true Imam, Imam of Haqq after him. Shehzada Husain Bhaisaheb related the numerous hadith of Rasullulah showing that Hasan and Husain are both true Imams after Maulana Ali. Shehzada Husain Bhaisaheb related the 5th trait of Rasullulah’s hadith, that a Mumin should reach and self reflect and take account of his deeds. Syedna Taher Saifuddin has guided Mumineen, that before one sleeps each night, spend 10 minutes reflecting on each of your acts today. Reflect and assess which of these were good acts, which he/she should not have done, and strive to improve and correct each day. Shehzada Husain Bhaisaheb read the shahadat of Abdullah, Hasan Imam’s son, in Karbala, how he wed him to his daughter Sakina and how the enemies massacred him but minutes after this. Mumineen’s hearts were moved as they understood the unsurmountable sacrifices of the Ashaab and Ahle Bayt. They stood for Husain, for what is the truth, for what Rasullulah and Maulana Ali have upheld, forsaking everything in the greatest of trajedies in Karbala. The waaz ended in remembrance of Imam Hasan and his shahadat and Mumineen wept profusely from their hearts, enriched with the ma’refat of the maqam of Hasan Imam. Shehzada Husain Bhaisaheb began the waaz with the khitab ‘Eh azadaraane Husain!’ Hearts melted in tears as Mumineen remembered our Maula Husain. 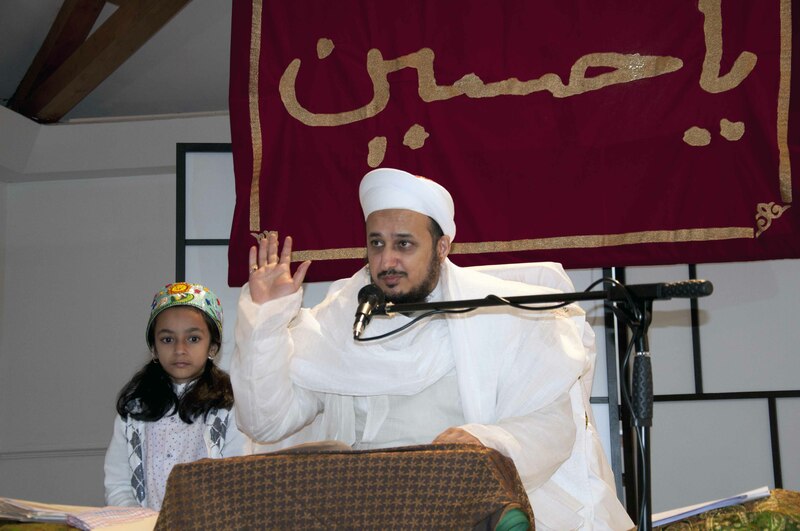 Through the days of Ashara at the London Ashara Waaz Hall, each heart was filled with the blessings of knowledge and each heart was abounding in gratitude. Each of Shehzada Husain Bhaisaheb’s waaz, through unobstructed, grounded explanation, had enabled Mumineen to further understand the basis of the rationale of religion, and for the choices each makes for life and for God, to do what is right, and to fulfill duties to both this world and for the hereafter. Today was the Ashura day and hearts were awaiting to hear the shahadat of Imam Husain and his Ahle Bayt and Ashaab. In the morning waaz Shehzada Husain Bhaisaheb reminded Mumineen of the hadith of Rasullulah of the great reward of heaven for those who weap on Husain. He read the hadith of Rasullulah, ‘he who weaps, makes weap, or shows grief on his face for my son Husain, for him heaven is ordained. Shehzada Husain Bhaisaheb related the well know account Ghulam Bani Riyah - his janaza was being carried by only 4 men, but many gathered clouds above moved with them. Rasullulah stopped the janaza and asked Maulana Ali if he recognized this man. He said yes, never would he meet me, but he would say, ‘inni wa allahi uhibbuka ya Maulaya’, - ‘O Maula, by God, it is thee I love’ Rasullulah said that the mass of cloud is a gathering of 70,000 angels who shade this follower of Ali. Rasullulah then prayed the janaza namaz on him, with Mawalana Ali, and the 70,000 angels. This is the reward for the Shi’a of Ali. Before finishing the morning waaz Shehzada Husain Bhaisaheb completed the 6 trait of Rasullulah’s hadith, that the Mumin has these three qualitites: He is like a tree whose roots of yaqeen are deep and its trunk tall with wide branches giving cover and shelter to all; that a Mumin is like a bee. The bee makes honey from within itself from which all taste the sweet. A Mumin benefits all those around him by his being and benefactor to all around him in this way. 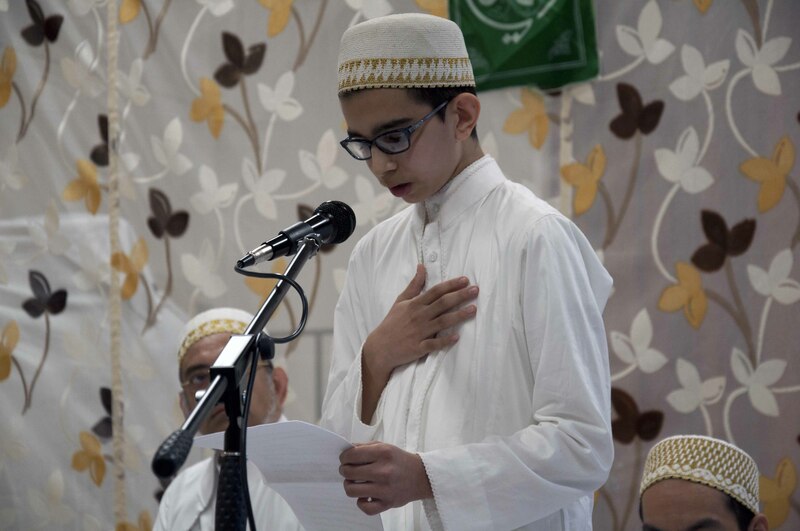 Wasila and doa at zohr asr namaz was recited with excellent delivery by Hatim Bhaisaheb Saifuddin, son of Shehzada Dr. Abdeali Bhaisaheb Saifuddin. In the afternoon, Husain Bhaisaheb recited the shahadat of Imam Husain, his Ashab and Ahle Bayt. Each Mumin’s heart wept tears of inner grief and the hall resounded continually in matam of our Maula Husain. 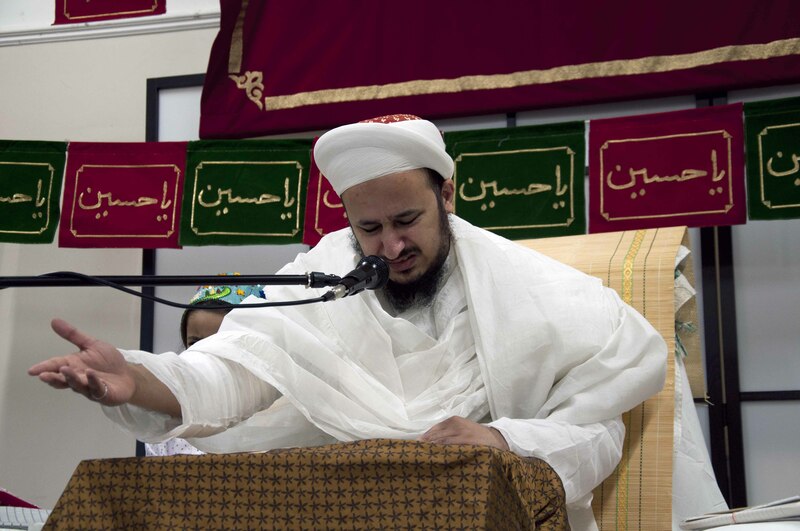 Bringing back the traits which makes us a Mumin, and giving Mumineen tidings of being followers of Haqq na Dai, Syedna Taher Fakhruddin, that Husain the most kind and compassionate Imam, the recourse of all, will hear and answer our prayers, Shehzada Husain Bhaisaheb read the maqtal of Imam Husain with great shaan. Showers of barakat rained down through the compelling and deep reaching, grief filled bayan of Shehzada Husain Bhaisaheb and the hearts and souls of Mumineen were replenished. Moved by Shezada Husain bhaisab’s outstanding delivery of the recount of the shahadat of Imam Husain. As mumineen did matam of Imam Husain, tears of grief flowed from every eye, hearts were moved and the remembrance of our Mawla, Aqa Husain and his sacrifice for us was renewed. 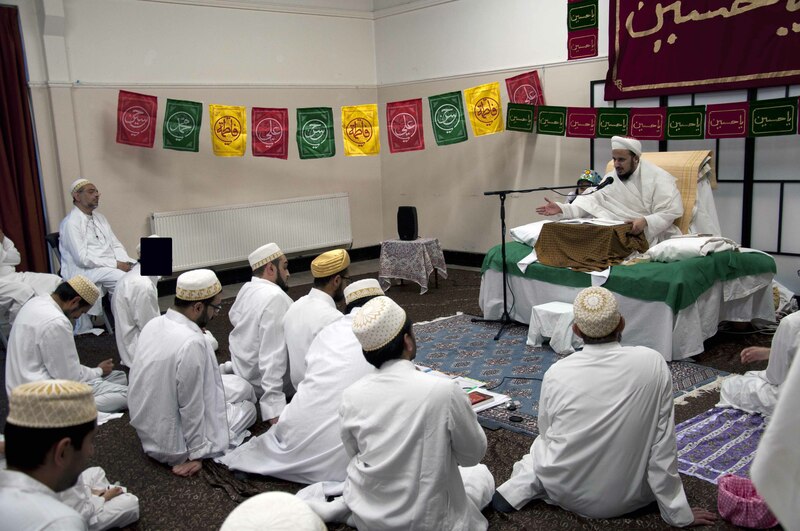 Through the days of Ashara at the London Ashara Waaz Hall, each heart was filled with the blessings of knowledge and each heart was abounding in gratitude. Each of Shehzada Husain Bhaisaheb’s waaz, through unobstructed, grounded explanation, had enabled Mumineen to further understand the basis of the rationale of religion, and for the choices each makes for life and for God, to do what is right, and to fulfill duties to both this world and for the hereafter. Through this deepened understanding, in Ashura Mumineen were blessed with pouring showers of barakaat through Husain Bhaisaheb’s recital of maqtal, and Mumineen wept continual tears of utmost grief and did matam all day in remembrance of the tragedy of Karbala.